LOW HOURS, GREAT CONDITION – LIKE NEW! 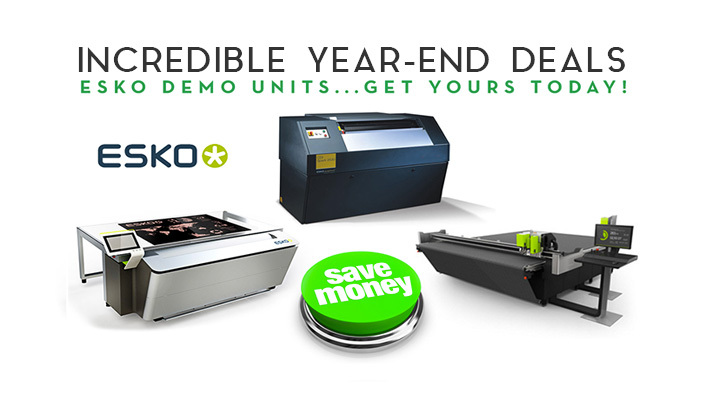 CTGA is offering incredible, limited time, year-end deals on Esko Platemaking Equipment. Previously used as demo units, these machines have very low hours, are in excellent like new condition, and can be yours at a great discount saving you lots of money on this state of the art equipment from Esko! Treat yourself to an early holiday gift this year, and contact CTGA today to learn more about this exciting opportunity! CONTACT CTGA TODAY AND SAVE! If you’re interested in taking advantage of this amazing opportunity during our Year-End Sale on Esko Demo Equipment, Contact CTGA today and speak with one of our sales reps. Don’t miss this limited time special offer! Looking To Bring Platemaking In-House? If you’ve been considering bringing platemaking in-house, Correct-Touch Graphic Arts can make it happen. 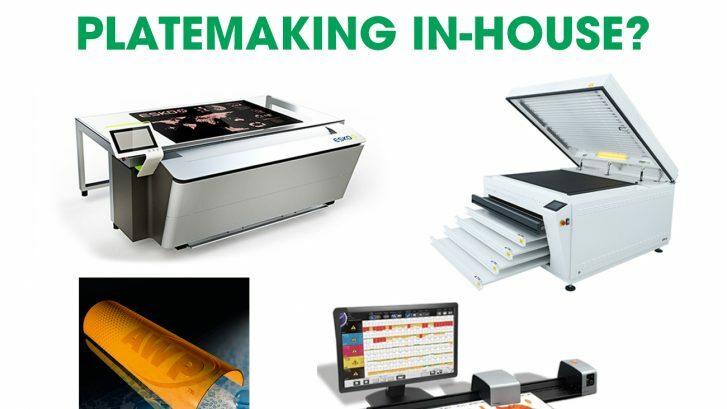 Not only do we carry platemaking equipment, supplies and plate material from the top brands in the industry, but we also provide you with a one-stop resource for consultation, installation, maintenance and service. When you work with CTGA we become your partner in the success of your business! Contact us today and get started. We will work with your pre press provider to optimize art files, using the latest screening technologies and press characterization software. It’s been a hot summer, and it’s about to get even hotter with this once in a lifetime offer from CTGA on some of Esko’s most popular products! 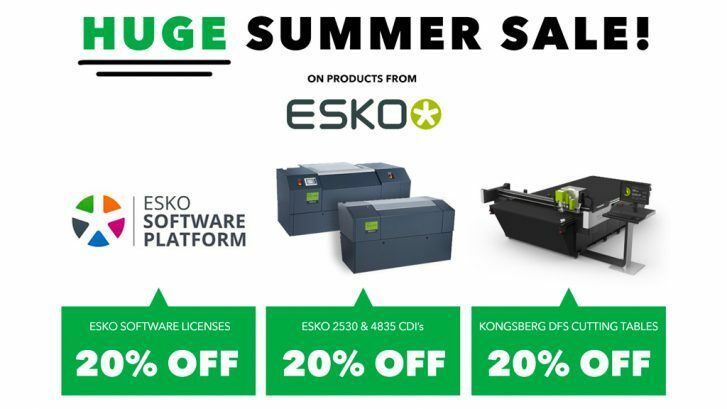 Don’t miss your chance to take 20% off your purchase of Esko software licenses, 2530 & 4835 CDI’s or Kongsberg DFS Cutting Tables. This is a chance for some HUGE SAVINGS on products from Esko that can bring your level of success to the next level! Contact CTGA today and find out more about this incredible deal, but hurry, the sale ends on September 30th. To take advantage of this deal on Esko products, contact your CTGA sales rep for more information immediately. Again, this is a once in a lifetime opportunity, but it won’t last forever so act quickly! 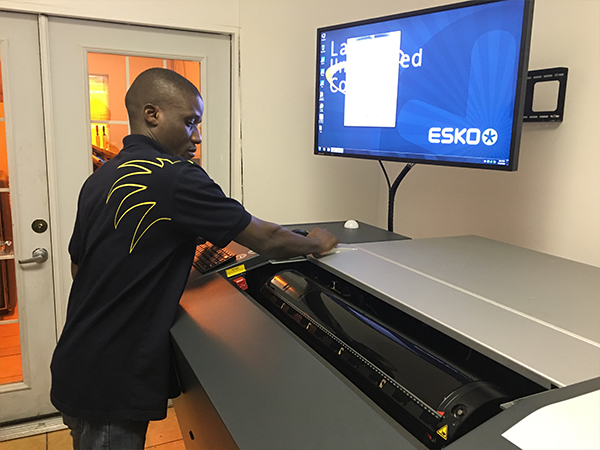 For plates and sleeves, for letterpress and flexo plates: whatever your type of business, Esko has the most advanced digital flexo solution. 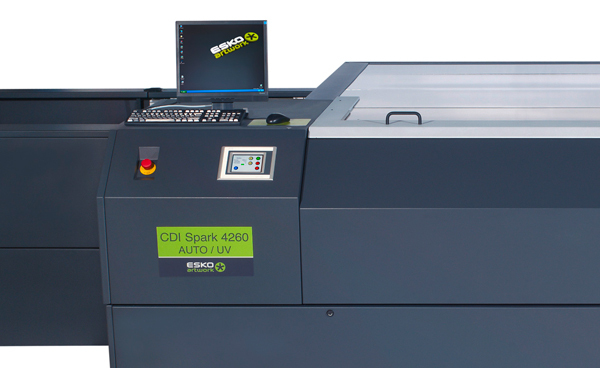 Esko CDI Digital Imagers offers superb results that before were only achievable in offset or gravure. There is a CDI for every need: from narrow web label printing, to flexible packaging and wide format corrugated printing; from one color printed corrugated boxes to highly sophisticated multi-color packaging and even security printing. Check CTGA’s full range of CDI imagers here. The new quality standards for flexographic printing! HD Flexo and Full HD Flexo combine high resolution imaging with advanced screening. Achieve significant cost savings through automated flexo plate optimization. The Digital Flexo Suite is a collection of Esko’s plate making software, designed especially for the needs of the packaging industry. Smaller print runs? Flexo is the answer. Print runs are getting smaller and smaller. This trend comes from the fast moving consumer goods and retail business. Companies in this business continuously need to engage the consumer with appealing, customized, seasonal or even personalized messages. For some packaging converters, this present a problem: gravure is too expensive on smaller runs. Flexo offers the perfect solution: with HD Flexo, flexo printers can now rival the quality of gravure, but with less prepress costs. CTGA recently helped another one of our customers make the move to digital utilizing Esko’s Full HD plate making system, and Asahi’s flexo plate technology. Labels Unlimited Company of Chicago wanted to upgrade their workflow, plate making quality and consistency with the move to Esko’s digital system, and CTGA was there to help them make it happen. Labels Unlimited Company, established in 1968, specializes in flexographic printing of pressure sensitive labels and hang tags. They manufacture custom tags and labels for customers throughout North America. 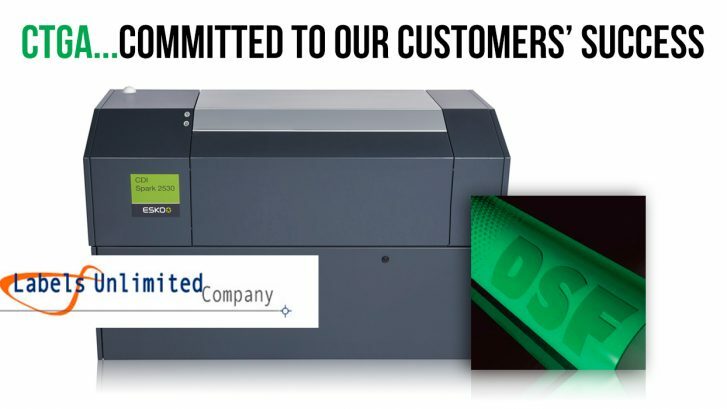 With their long standing commitment to quality and service in mind,Labels Unlimited sought to move to the latest imaging and screening technologies available. The answer was Esko’s CDI plate making equipment with Full HD, along with the proven technology of Asahi’s flexo plates. “As a company we’ve always been dedicated to providing our customers with the highest level of service and quality printing possible. Esko’s Full HD plate making system, andAsahi’s flexo plates allow us to continue that commitment to our customers, while creating a more efficient and sustainable workflow in our production. CTGA’s expertise in working with Esko and their line of Asahi flexo plate materials made it a no-brainer for us to work with them in making this switch to digital. They helped us every step of the way, and we couldn’t be more pleased with the level of service and support we received from the CTGA staff. The implementation of the CDI and support of both Esko and CTGA really highlighted this commitment, and our quality and consistency has drastically improved. As the exclusive distributor of Asahi flexo plates in the U.S., and one of the top sellers of Esko plate making equipment, CTGA is so excited to provide companies like Labels Unlimited with the tools they need to succeed with today’s ever-changing technology. We believe in the quality and effectiveness of the products we sell, and our sales representatives are trained thoroughly in order to help assist our customers from consultation through installation and beyond. If your company is interested in learning more about CTGA’s U.S. exclusive line of innovative Asahi Flexo Plate Material, or our line of Esko Digital Flexo products, please do not hesitate to contact CTGA today and speak with one of our technical sales representatives.